WHO Expects Ebola To Spread In Congo In Areas Too Dangerous To Send Workers The World Health Organization says violence and insecurity in the Democratic Republic of the Congo's North Kivu region is preventing health workers from stopping the spread of Ebola. 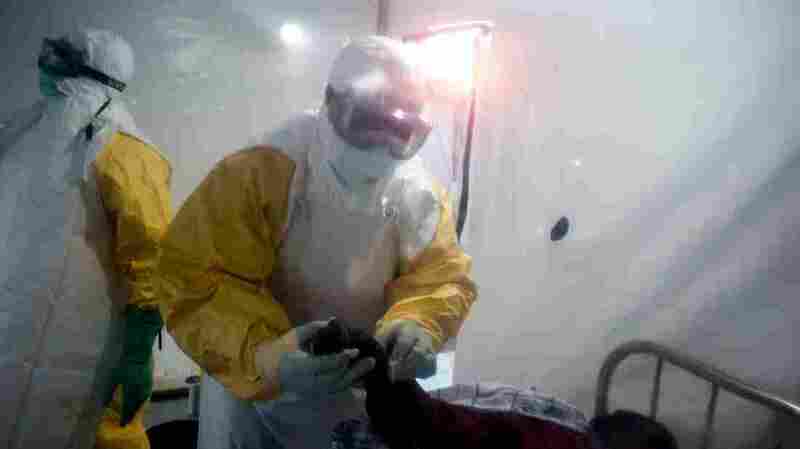 An Ebola patient is being checked by two medical workers on Wednesday in Beni, in the Democratic Republic of the Congo's North Kivu region. Congo's health ministry declared an outbreak of Ebola on Aug. 1 in the North Kivu region. As of Wednesday, the WHO reports 51 confirmed cases and 27 probable cases of Ebola in the region, with 44 people (17 confirmed, 27 probable) having died of the disease. "We don't know if we are having all transmission chains identified. We expect to see more cases as a result of earlier infections and infection developing into illness," Jasarevic reportedly said. "We still don't have a full epidemiological picture. ... The worst-case scenario is that we have these security blind spots where the epidemic could take hold that we don't know about," the wire service quoted him as saying. North Kivu — "a lawless, mineral-rich area in the northeast of the country," as NPR's Jason Beaubien describes it — is home to 8 million people. "Over the last decade armed groups in North Kivu have massacred civilians and each other while vying for control of the province's deposits of gold, diamond and coltan, an ore used in cellphones and other electronics," Beaubien reports. The WHO says the area "has been experiencing intense insecurity and worsening humanitarian crisis, with over one million internally displaced people and a continuous efflux of refugees to the neighbouring countries, including Uganda, Burundi and Tanzania." About 1,500 miles away in the DRC's northwest Équateur province, the WHO had just declared a previous Ebola outbreak over on July 24. It said the next day that 33 people had died in that outbreak that had been declared in early May — a relative success compared with the devastating outbreak in 2014 through 2016 in West Africa that left more than 11,300 people dead. The WHO's response in May involved the first widespread use of the experimental Ebola vaccine rVSV-ZEBOV since testing started in 2015. On Friday, the WHO said more than 500 people, including health workers, had been vaccinated against the disease in the North Kivu outbreak.